This is the new trailhead (Fall 2018) that IDL put in to protect the soils and other natural resources and to prevent recreational users from trespassing on adjacent private lands. This project is entirely funded from OHV registration sticker fees. Several volunteers from the Pend Oreille Pedalers bicycle club also assisted in building these new multi-use trails. More improvements are planned such as trail marking, a trailhead kiosk with maps and information, and a vault toilet. The trailhead will be accessible to hiking, bicycling and motorcycling only. 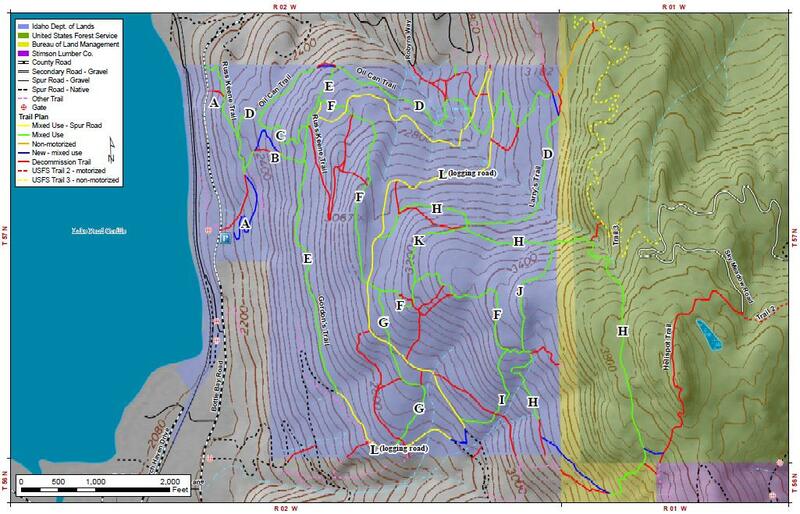 We will have the trails shown and the downloadable .KMZ files of the trails as soon as they are available (Spring 2019? ).